The Fox River is already one of Bark River’s most popular hunting knives. I predict this version, which combines the Fox River blade with the proven Bravo handle, will be even more popular. 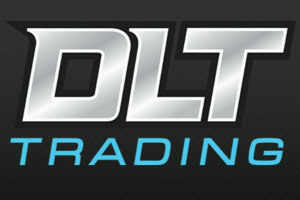 Disclaimer: DLT Trading, Knivesshipfree, L.T. 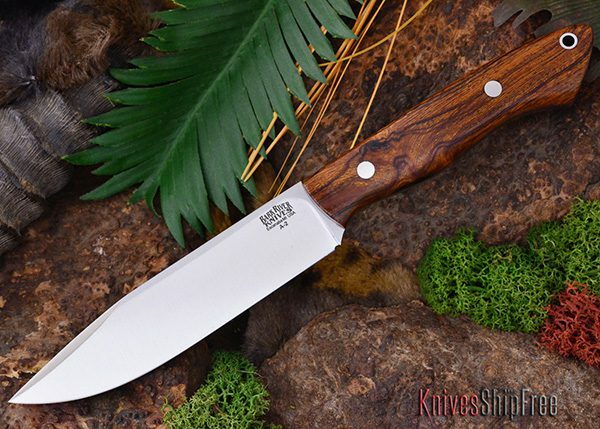 Wright Custom Knives and Jesse Hemphill are Survivalcommonsense sponsors. None of them had any input in this post. 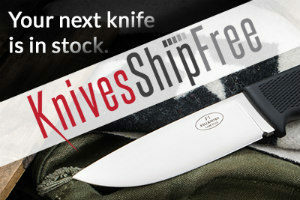 I did not get a free knife, nor was I paid to review this knife. All remarks are my opinions, and all I ever promise is a fair shake. Sometimes the best knife reviewers are people with no experience or interest. On Thanksgiving, my brother-in-law, Buzz Pickens, was using my EXT-2 to carve the turkey and slice the ham. Buzz doesn’t hunt, is a superb professional musician and a big city kind of guy. His urban lifestyle is about as far from mine as can be imagined. He didn’t own a personal knife (other than kitchenware) until I gave him one last year at Christmas. I asked how he liked the EXT-2. My first Bark River knife was the original Fox River. Right out of the box, I loved the quality and blade design, and anticipated a long and useful working relationship with it. 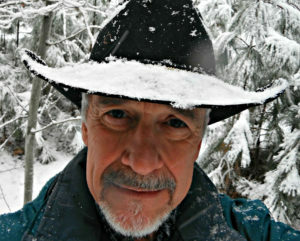 I carried it one deer season, hoping to wring it out on a buck. But I didn’t kill a deer that year, and had to imagine how well it would work. But try as I might, I just couldn’t get used to the handle. It was too short and uncomfortable for my hand, and I never felt secure using it. 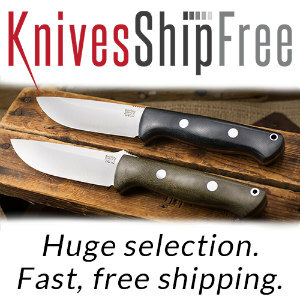 That started my relationship with Bark River Knives, and gave me a chance to check out their warranty. That was several dozen BRs ago, and I have done many reviews and currently have four Bravos that are used regularly. I have used BRs with both the Aurora and Bavo handles extensively, and ordered an EXT-2 as soon as one was available. 4:05 P.M. Campbell Swamp, Mississippi: I would not shoot a deer after 4, I vowed, because the stand was about one-half mile from the road, and it would take about an hour to gut, skin, quarter and carry out the meat. By then, the sun would have set and any field dressing chores would have to be done in the pitch darkness. I was waiting for a buck, and watched several does for about 45 minutes. On the shot, the doe dropped in her tracks, and I rushed out to start the field work. (19 deer with 19 shots with my 7mm-08). Before doing anything, I paused for a moment to be reverent and show respect for the animal. Then I got to work. The EXT-2 would have to do everything. The Bravo handle provides a safe grip, even when it is covered with blood and the user is wearing cut resistant gloves. Handle material: I want micarta for a working knife handle. Micarta is tough, durable and good looking. That said, my other Bravos have wood handles, and they get used hard. The EXT-2 was dipped in the bloody slurry of the abdominal cavity after I split the ribcage and cut the esophagus. It never got slippery. If anything, the handle got tackyer (Did I just invent a word?) and more secure in my hand. I was wearing latex and cut resist gloves and there was no danger of my hand slipping down the handle. Steel: CPM 3V is one of my favorite knife steels. It’s tough, holds an edge and doesn’t easily stain if it is maintained after use. After I started carrying Bark Rivers in A2 or CPM 3V, I quit taking along sharpening equipment on backpack hunts. There is always the full compliment of sharpening gear back in camp, of course, but the BRs rarely need any touching up, even after hard use. Blade thickness: At .156, the blade is stout enough for heavy use. I prefer thinner blades in working knives, as did the Vikings and Mountain Men. But with today’s super steels, you’d have to be a real klutz, and work at it, to break one of these blades. The EXT-2 blade thickness is about right for a hunting knife that might be called upon to be a survival tool. 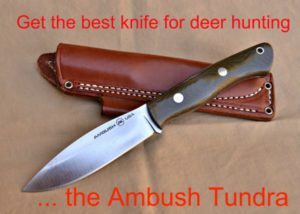 Point: It’s hard to disagree with a drop point on a hunting knife. The point is centered just above the mid-point width of the blade. 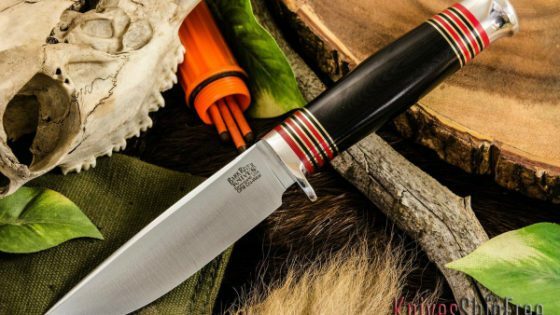 This will allow the user to perform bushcraft skills, drilling in wood, for example, while the blade still maintains a nice belly for skinning. Grind: All Bark River knives have a convex grind. That means the blade, rather than tapering with straight lines to the edge, has a curved taper. Such a shape keeps a lot of metal behind the edge, making for a stronger edge while still allowing a good degree of sharpness. Convex rules. There are many grinds that can be chosen for a hunting/survival knife, and I’ve tried most of them, but IMHO, the search ends with convex. Blade design: With a deep forward belly for skinning and a broad blade for making deep cuts, this design worked really, really well. Sheath: The leather Janna Martin Vehement Knives sheath design is a great choice for this knife. It is comfortable to wear and protects the user and the edge. 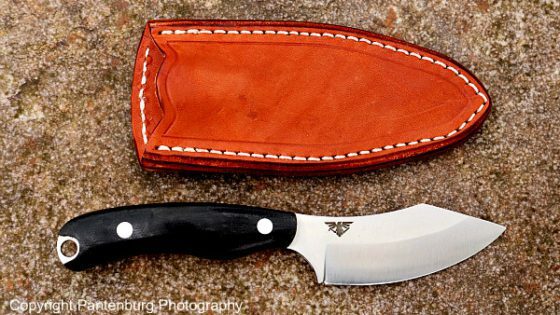 I liked this sheath so much it got its own review. Weight: Lightweight and compact, this knife is easy to take along. 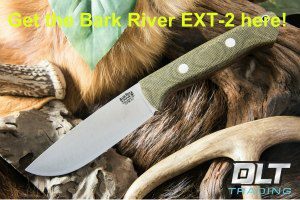 So is the EXT-2 the best hunting knife? Well, I couldn’t find anything to complain about, or come up with any suggestions to improve the EXT-2. The design is incredible for a working hunting knife, and it performed exactly as I thought it would. So it all comes down to personal preference. I could use the EXT-2 quite happily all deer season season. If I didn’t already have a proven Tundra and BR Bravo 1.25, there is no question which knife would be in my hunting daypack this season. 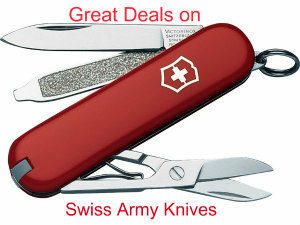 But the EXT-2 may be just what you’re looking for, and it’s a knife you can rely upon. 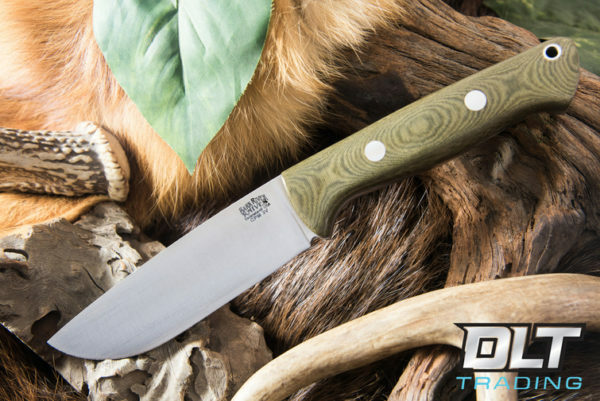 If you search for it as a “Bark River” knife, you will not find it.